The Army's decision yesterday to keep a Stryker brigade at Schofield Barracks was applauded by Hawaii's congressional delegation, which said it reflects the isles' strategic location in the Pacific. In rejecting basing options in Alaska and Colorado, the Army says it can now complete $250 million in Stryker-related construction projects on Oahu and the Big Island. David Henkin, an attorney for environmentalists and Hawaii activists opposing a 4,000-man Stryker unit here, said he is glad the military is now willing to take "a serious look" at using the Big Isle's Pohakuloa Training Area instead of Makua Valley for live-fire exercises. 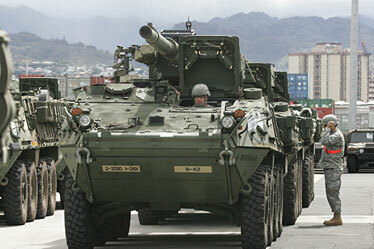 A specialized Stryker vehicle mounted with a cannon lines up in Honolulu last year to board a military ship bound for Fort Irwin in California. The Army says it can now complete more than $250 million in construction projects blocked by environmentalists and native Hawaiian groups who opposed plans by the Pentagon to station its fifth Stryker brigade combat team in the islands. These projects would include building private roads from Schofield Barracks to Dillingham Airfield, another one from Schofield to Helemano and from Kawaihae Harbor to the Pohakuloa Training Area on the Big Island to keep the Stryker vehicles and other troop movements off civilian highways. Other projects would be clearing and upgrading several firing and training ranges at Schofield Barracks. Opponents like William Aila, who have argued that the Army failed to adequately consider mainland locations, reserved comment because they haven't seen the Army's decision. Since 2001, the Army has wanted to convert the 25th Infantry Division's 2nd Brigade Combat Team to an infantry unit built around 325 19-ton, eight-wheeled combat vehicles. More than $700 million was programmed for 28 construction projects to support the Stryker unit and its 4,000 soldiers. However, two years ago opponents won a federal court order preventing the completion of at least seven Stryker projects until the Army did a supplemental environmental impact statement examining alternative locations in Colorado and Alaska. That study was completed two months ago and Lt. Gen. Benjamin Mixon, commander of U.S. Army Pacific, said yesterday the 2nd Stryker Brigade Combat Team will return to Hawaii from Iraq next year and make Schofield Barracks its permanent home. David Henkin, an attorney with Earthjustice, said yesterday he is reviewing the Army's decision and awaiting a decision from the federal court on the future of the Stryker construction projects. Henkin represents the Ilioulaokalani Coalition, Na Imi Pono and Kipuka. The decision to station the Stryker unit here was hailed by Hawaii's congressional delegation. Sen. Daniel Inouye said: "The Army's primary rationale for selecting Hawaii reflects what I have been saying: that Hawaii's strategic location best serves our national security needs and provides the best protection for our troops by allowing them to properly train nearby prior to a rapid deployment to dangerous locales in the volatile Asia-Pacific region." Sen. Daniel Akaka added: "We can and must find a balance between preserving Hawaii's natural and cultural resources, and our need to make sure our brave men and women in the military have the training they need to fulfill their missions." Rep. Neil Abercrombie said he is "looking forward to reading the decision and understanding the Army's rationale." The decision is expected to be made public Friday. With a home at Schofield Barracks, the Stryker Brigade "is best able to meet the Army's strategic defense and national security needs in the Pacific theater," Mixon said. "This decision considered the limitations in Hawaii in terms of training ranges, maneuver land, and impacts to sensitive environmental resources as well as the other considered locations. "Stationing the 2/25th SBCT (2nd Brigade/25th Division Stryker Brigade Combat Team) in Hawaii sends a powerful signal to our friends and our enemies that we are committed to U.S. interests in this vital region," Mixon added. In a written statement, Lt. Gen. James Thurman, Army deputy chief of staff, said the Pentagon's strategy is now focused on placing additional combat power in the Pacific. The Army has maintained that adding a Stryker unit in Hawaii to support an existing unit in Alaska gives it the "strategic flexibility" to support all contingencies, especially when the weather is bad in Alaska. Henkin said "the good news" in yesterday's decision is that the Army is now saying stationing a Stryker unit in Hawaii does not make resumption of live-fire training at Makua Military Reservation "a foregone conclusion." The Army still hasn't released a long-awaited environmental impact statement on continued use of Makua, which is opposed by Henkin's clients. Under a federal court agreement, the Army was forced to stop firing live ammunition in the valley in 2001 until it completed an environmental impact study, which was supposed to be completed in 2004. » $30 million for a 24-building mock city that would include two warehouses, four offices, one municipal and one office structure, a service station, hotel, police station, graveyard, bank, townhouse, nine homes, school and an airfield at the Kahuku Training Area. » $8 million to modernize five pistol, rifle, machine-gun, sniper and mortar-firing ranges at Schofield. » $7 million to purchase 27 acres of easement to build a 12-mile vehicle trail between Schofield Barracks and Helemano Military Reservation. » $30 million to upgrade platoon live-fire range at Schofield Barracks. » Construction of a 15-mile road between Schofield Barracks and Dillingham Military Reservation to take Stryker and other 25th Division vehicles off city roads. The new road would be built in 2010. » Upgrading the parking aprons that will be used by C-130 cargo and troop transport aircraft at Wheeler Army Airfield. Construction is set for 2010. » Construction of a 30-mile private military road on the Big Isle from the port of Kawaihae to Pohakuloa Training Area. » 1999: Army Chief of Staff Gen. Eric Shinseki proposes a new Army force to give it more flexibility to respond to missions. » 2002: 25th Infantry Division's 2nd Brigade is chosen to be one of six Stryker units. » May 2004: Army releases environmental impact statement (EIS) backing conversion of the 2nd Brigade to a Stryker unit. » 2004: Earthjustice, representing three environmental and Hawaiian activist groups, files a federal lawsuit charging that the $1.5 billion Stryker project at Schofield Barracks would damage native Hawaiian cultural sites and harm endangered plants and animals. » 2005: U.S. Judge David Ezra rules the Army's EIS adequate. » 2006: 9th U.S. Circuit Court of Appeals reverses Ezra's decision and orders Army to consider alternative locations. » November to December 2007: 2nd Stryker Brigade Combat team deploys to Iraq. » February: Army releases supplementary EIS that favors Schofield Barracks over bases in Colorado and Alaska.